Many people choose down bedding because of its luxurious feel and comfort. However, many people also suffer from allergies and are unable to sleep with a down comforter. Luckily, there is another option...down alternative! Down Alternative has become a popular choice in bedding for those who suffer from allergies or are sensitive to indoor triggers such as dust. In fact a lot of people are not actually allergic to the down itself, but to the dust mites and particles that live in the down. A down alternative comforter is a great choice for anyone with or without allergies. This type of bedding is filled with synthetic materials as opposed to goose or duck feathers. 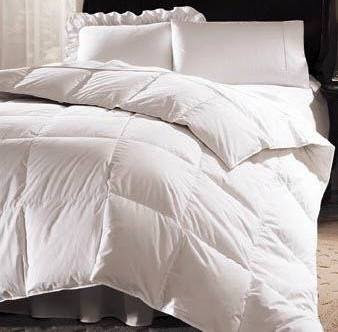 A down alternative comforter is just as soft and breathable as a real down comforter. There are many benefits in choosing a down alternative comforter, you no longer have to deal with those pesky feathers that end up everywhere and my personal favorite...no more dry cleaning bills!!! You can throw the comforter right in the washing machine! Not only is an alternative down comforter a great choice for comfort, but also style! You can easily change the entire look of your bedroom by slipping on a new duvet cover. By choosing this type of bedding you really just can't go wrong! Nowadays, the material is a blended fiber which is cotton and polyester that keeps the sheets wrinkle free. silk bed sheets King The feel and comfort of sheets varies with its fabric.